The news from Beijing is historic – nothing less than a political earthquake with repercussions around the world. At its upcoming “parliamentary session” (the National People’s Congress, NPC, which starts next week), China will remove the two-term limit for the presidency and vice presidency. This confirms what was widely expected; that Xi Jinping plans to extend his rule after his current second term finishes in 2023. Xi has cemented his grip over the Chinese regime through a ruthless power struggle and anti-corruption purge, forcing factional opponents and recalcitrant regions to “bend the knee”. This was further confirmed by his “coronation” at the so-called Communist Party’s (CCP) 19th Congress in October, at which Xi imposed his own choice of leaders, eliminating or demoting possible challengers, and inserted his “thought” into the constitution. Despite being widely expected, the latest move to allow Xi to indefinitely extend his reign as president (there is no limit on Xi’s other and actually more powerful position as CCP general secretary), has elicited shock and alarm from international commentators and Chinese dissidents alike. The news came on Sunday 25 February in a brief statement from Xinhua news agency. China’s social media, the only public arena for limited and often coded political debate, went into overdrive with posts likening Xi’s move to North Korea’s dynastic dictatorship and China’s old imperial order, which were quickly erased by state censors. 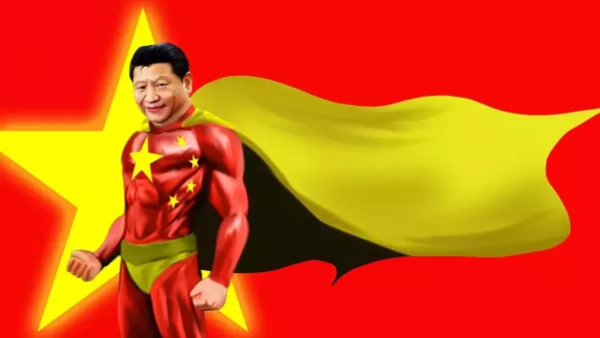 In overseas media, the Guardian newspaper quoted China watcher Bill Bishop saying Xi has mutated into a species of “Putin-plus” – only Xi is “much more effective, much more powerful and, frankly, much more ambitious” than the Russian leader. And he’s running a much more powerful state and economy, we might add (China’s GDP is more than eight times larger than Russia’s). Many commentators have – correctly – expressed fears that state repression in China and the shift to greater authoritarian control, already a clear trend under Xi’s first five-year term of office, will worsen. The list of topics banned by China’s internet censors since Sunday’s announcement gives a picture of the political mood at least among significant numbers who oppose Xi’s establishment of one-man dictatorship. These topics include not only “two-term limit” and “constitutional amendment”, but also “I disagree”, “North Korea”, “Winnie the Pooh”, and “Yuan Shikai”. The cartoon bear Winnie the Pooh, who some say bears a resemblance, is used to poke fun at Xi Jinping, while Yuan Shikai was a general involved in the 1912 Chinese Revolution who staged a coup and tried to declare himself emperor. Even George Orwell’s book “Animal Farm” became a banned topic in the latest online clamp down. State media have run articles to drown out any criticism. The Global Times said abolishing the two-term limit would “improve government” and said criticism of the move was due to “misinformation and external forces”. During his first term, starting in 2012, Xi downgraded most of his peers in the top CCP hierarchy, breaking up and bypassing the ‘collective leadership’ model developed in the Deng Xiaoping era of the 1980s and 90s. Ultimately, it is a dictatorship as before. But under Xi it is a regime with an unprecedented centralisation of power, at least since the shift to capitalism began 40 years ago. Many capitalist commentators fear this will make the regime more unpredictable and prone to miscalculations. They especially fear the ramifications of this on the global stage – with Xi’s stridently nationalist agenda and his monster “Belt and Road” plan to extend China’s global economic reach. “Xi Jinping is susceptible to making big mistakes because there are now almost no checks or balances,” said Willy Lam, a Hong Kong-based author and biographer of China’s leaders including Xi. “Essentially, he has become emperor for life,” Lam told the New York Times. Xi used the CCP’s anti-corruption arm, the CCDI, as a ruthless and widely feared tool to consolidate his power in the intra-regime struggle. Over one million CCP officials have been punished during the past five years. The CCDI will now be merged into a new and more formal state body, the National Supervision Commission, with greater powers. This is another decision that will be rubber stamped at the NPC’s meeting in Beijing opening on 5 March. Xi has also spearheaded the most intense crackdown on political opposition, human rights lawyers, NGOs, bloggers and labour activists. This is the generally regarded as the darkest period of repression since the immediate aftermath of the Tiananmen Square democracy protests in 1989. State repression under Xi has been especially severe in minority regions like Tibet and Xinjiang, and has also spread to Hong Kong, and increasingly even overseas with illegal abductions and financial pressure exerted on foreign governments and businesses not to “offend China”. “It will get worse, for sure … the consequences will be very severe,” warned Wu’er Kaixi, a former Tiananmen Square protest leader. Wu’er also criticised western leaders who he said had ignored dissidents’ warnings and instead “nurtured” Xi’s ambitions to become “a new 21st century dictator”. Not least among them is Donald Trump, who has praised Xi and is known for his own authoritarian tendencies. There is massive frustration among Chinese dissidents like Wu’er Kaixi over the silence of the “international community” in the face of Xi Jinping’s authoritarianism. The reason is that Xi’s policies have largely saved global capitalism during the past few years of global crisis, by seeming to steer China through severe economic tests and sustain its role as the main engine of global trade and GDP growth. Increasingly, however, China’s rise is challenging and undermining its major rivals, especially US imperialism. Today’s harsher international climate is also undoubtedly a factor behind the timing of Xi’s power grab. Xi’s leading coterie have moved now rather than waiting – perhaps anticipating that economic and geopolitical shocks are not far away. Socialists and chinaworker.info have explained that the rise of Xi as China’s new strongman is a deeply contradictory process. Xi and his allies, like the retired former anti-corruption czar Wang Qishan (who may yet be destined for a top role as the dictatorship’s old rules are being scrapped) have triumphed within the CCP’s factional struggle. But they have also been driven to do this by desperate pressures. China faces explosive social and economic problems which the current authoritarian state has been completely incapable of solving. This is despite its apparent economic successes (also hugely contradictory and uneven). China’s shift to a “lifetime dictator” system marks a turning point in world events and shows that China’s established political system has reached an impasse. It is a development as significant as the rise of Trump and Trumpism as a symbol of the political dysfunction of US capitalism. The break-up of the Dengist ‘collective leadership’ model, which was an attempt to use power sharing, consensus and structured leadership succession to safeguard ‘stability’ and preclude against upheavals or radical change, shows the regime under Xi has entered unchartered territory.